Western Serviceberry, also known as Saskatoon, is a delightful native shrub cultivated for its racemes of adorable, 5-petaled, star-shaped, white-pink flowers, and its fine autumn color and fruit. It grows up to 12 ft tall and wide. Young leaves are silver toned, and they open along with the flowers in early to mid-Spring. The spherical maroon-purple fruit attracts wild birds, ripen in the summer, and are also edible for humans! 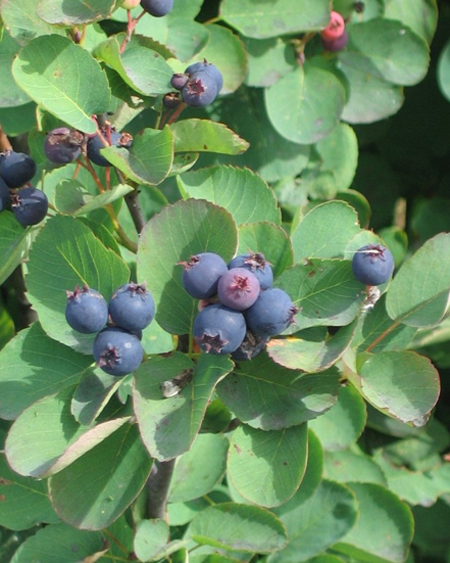 Amelanchier alnifolia is found in its native habitat along moist woodlands and stream banks. Plant yours in acidic, fertile, moist but well-drained soil in the sun or partial shade. These plants are perfect for growing along the edges of woodlands, in shrub borders, or as specimen plants.